My next step is partially done. I've sewn blocks of 4 matching HSTs together; 42 blocks, so far. I'm still winging it and didn't want to go all crazy and sew everthing together without a firm plan. I had to pay attention when I did the blocks with the stripes. They really looked wacko, if all the stripes didn't go the same way! This fellow was visiting my garden, and was kind enough to pose for me. I haven't participated in Macro Monday for a long time. 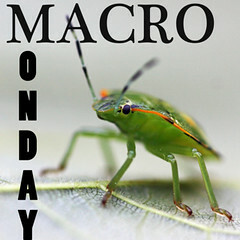 Today, I'm linking up with Lisa for Macro Monday. Interesting visitor. Your blocks are beautiful too. Nice shot of the hopper! i am sure it will look amazing in the end! Also, really great picture of the grasshopper. Swing by my site if you have time :) Thanks for sharing! I love those quilt blocks!